Along with numerous campus activities and earning Dean's List grades, rising junior Taylor Berlin is an Advisory Neighborhood Commissioner. American University is consistently ranked one of the most politically active campuses in the nation. Surprisingly, though, a presumed AU seat on a DC Advisory Neighborhood Commission remained unfilled for more than two years. With that bothersome reality in mind, Taylor Berlin decided to act. James Harnett—a George Washington University student, friend, and current commissioner—reached out to Berlin about the need for another student ANC member. At first, Berlin—an already hyper-busy AU student—had little desire to hold office. Choosing to pursue the position was just the first step. During a non-election year, she needed to gather 25 signatures for a petition. Yet if you read the fine print, that’s much, much harder than it sounds. The signatories of her petition had to be registered to vote in DC, and many AU students prefer to register in their home states. They also needed a 4400 Massachusetts Avenue address, according to the old maps, which ruled out students living on East Campus. She got on the commission, holding the 3D07 seat. Sworn in by DC Councilmember Mary Cheh, Berlin’s parents and campaign helpers were on hand. Much of her work, she says, is being responsive to constituent needs. “It is the most local form of politics, which in some ways makes it the most emotional form of politics. I think it affects people’s lives—maybe in small ways, but every day it can mean something,” she says. The job entails everything from writing resolutions to zoning commission hearings to liquor license approval for local businesses. She gave testimony to the City Council in support of a measure to lower the voting age. She champions AU, and she thinks having an AU student at meetings facilitates a better relationship with the neighborhood. And she’s also come to appreciate helping non-student constituents in the community. Berlin grew up in Trumbull, Connecticut, and engaged in politics early. She worked for Republican Gubernatorial candidate Tom Foley, whose campaign was the “only one to call back a 14 year old.” She later interned in a local office of US Rep. Jim Himes, D-Conn. While just a middle schooler accompanying her older sister—who ended up at GW—on DC college tours, Taylor set her sights on AU. “I said, ‘I’m going to go to this school. Watch me.’ And I bought a T-shirt that day. I’m very good at planning,” she jokes now. As a high school senior, she attended an admitted AU student overnight on campus. She quickly realized she’d found her people. Her CNN news notifications were unusual in her Connecticut high school, but Berlin and her future AU classmates all started getting the same news alerts on their phones. “It just clicked that I was around people who were finally interested in the things that I was interested in,” she remembers. At AU, she’s found more of those like-minded students, joining quite a few campus organizations. She’s a member and mentor for AU College Democrats, and she does similar mentoring with AU Hillel. Berlin is also a member of the Model UN team, AU International Relations Society, and Alpha Xi Delta sorority. 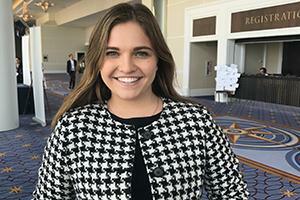 Amid all of her campus activities, she’s put in time at the Federal Communications Commission, Ralph Northam’s Virginia gubernatorial campaign, and this summer, she’s working in Washington at The NewDEAL, Developing Exceptional American Leaders. Berlin’s activism and ANC service didn’t happen in a vacuum, of course. She worked on the 2016 Hillary Clinton presidential campaign, and she was distraught watching election returns on the third floor of SIS.